In 1869, Johann Friedrich Miescher, a young Swiss medical student, discovered an acidic substance that he isolated from pus cells obtained from bandages used to dress humans. He found it in the form of a mixture of compounds in the nucleus of the cell and named it “Nuclein”. The nature of Nuclein was unusual as it contained large amounts of both nitrogen and phosphorous and at that time these two elements were known to coexist only in certain types of fats. Even though the discovery of Nuclein by Meischer took quite early but the discovery of DNA as genetic material took very long to be discovered and proven. By 1926, the quest to determine the mechanism for genetic material had reached the molecular level. In addition to this, different discoveries and findings by the scientists further narrowed the search for the genetic material to the chromosome located in the nucleus of most cells. But the key genetic molecule was still not found. In 1928 English microbiologist, Fredrick Griffith found that nonpathogenic mutants of Streptococcus pneumoniae could be transformed into pathogenic forms by changing their physical forms. 1. He injected mice with a mixture of heat-killed S strain (pathogenic) and live R strain (non-pathogenic) pneumococci. The mice died, and live S strain pneumococci were recovered from their blood. 2. But, when either only live R strain (non-pathogenic) were injected or heat-killed S strain alone were injected, the mice lived. He concluded that some “transforming principle” was transferred from heat-killed S strain to the non-virulent R strain, which enabled them to become virulent. This must be due to the transfer of genetic material. In 1931, Richard Sia and Martin Dawson performed the same experiment in vitro, showing the mice played no role in the transformation process. For a very long time after the discovery of Nuclein, it was thought that the proteins carried the genetic information and nucleic acids were having only structural functions. But somehow the search for the chemical identity of the transforming principle reached its climax in 1944. In 1944, Oswald Avery, Colin Macleod, and Maclyn McCarty provided the first solid evidence of DNA as the genetic material in their work on the transforming principle found in Griffith’s experiment. The transformation carried out by heat-killed S strain bacteria was inhibited, when the highly purified extract of that strain was subjected to the activity of Pancreatic Deoxyribonuclease (DNases). They also found that Protein-digesting enzymes (proteases) and RNA-digesting enzymes (RNases) did not affect transformation, so they were not involved in Griffith experiment. Hence, they concluded that DNA is the genetic material and caused the transformation from heat-killed virulent bacteria to the live non-virulent bacteria. The second proof that DNA is genetic material was provided in 1952 by the experiments of Alfred Hershey and Martha Chase. They worked with bacteriophage T2, a virus that infects the bacterium Escherichia coli. The T2 phage consists of a DNA core that is surrounded by a protein coat. They labeled the nucleic acid part of the T2 phage with radioactive phosphorus and protein coat with radioactive sulfur. After infecting E. coli cells with labeled T2 phage, they were able to show the radioactive phosphorus remained in the cells, whereas the radioactive sulfur was largely lost. This showed that proteins did not enter the E.coli from T2 phage. Therefore, DNA was the genetic material that passed from T2 phage to E. coli. It is now clear that debate between Proteins versus DNA as the genetic material was unequivocally resolved from a Hershey-Chase experiment. 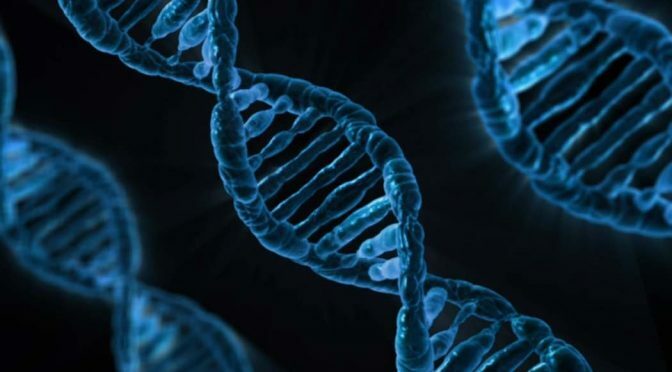 This way the journey of genetic material from Nuclein to DNA came to an end and it became an established fact that it is DNA that acts as genetic material. Previous PostAll You Need To Know About Biosphere Reserves.Next PostAll You Need To Know About Organ Transplant.